Clean Carfax and One Owner. The 2017 Chevrolet Equinox sits in the top third of the compact SUV class. It features a comfortable, placid ride and an excellent predicted reliability rating. The 2017 Chevrolet Equinox is a good compact SUV. Its spacious interior and flexible rear seats make it a great choice for families. The ride itself is comfortable and quiet, and the Equinox receives some of the highest predicted reliability and safety scores in the class. Our site has nearly 2,200 listings for the 2017 Chevrolet Equinox. Prices range from $17,700 to $26,500, with the average list price sitting at $21,100. Your final price will depend on the model you choose, as well as its condition, mileage, location, and features. The 2017 Chevrolet Equinox earns a predicted reliability rating of 4.5 out of five from J.D. Power. That score is among the best in the industry. Four trims are available: L (base), LS, LT, and Premier. The base Chevrolet Equinox L comes with a 7-inch touch screen, Bluetooth phone connectivity, OnStar, and a Wi-Fi hot spot with 4G LTE. To get available all-wheel drive, upgrade to the Chevrolet Equinox LS. It also comes with satellite radio, but there are few other standard add-ons. Because of the lower trims’ underpowered engines and limited optional features, most shoppers should select a higher trim level. The Chevrolet Equinox LT is a great value, has an available V6 engine, and offers more options than lower trims. In fact, if you want advanced safety features beyond the standard rearview camera, the Chevy Equinox LT is the lowest trim available with them. 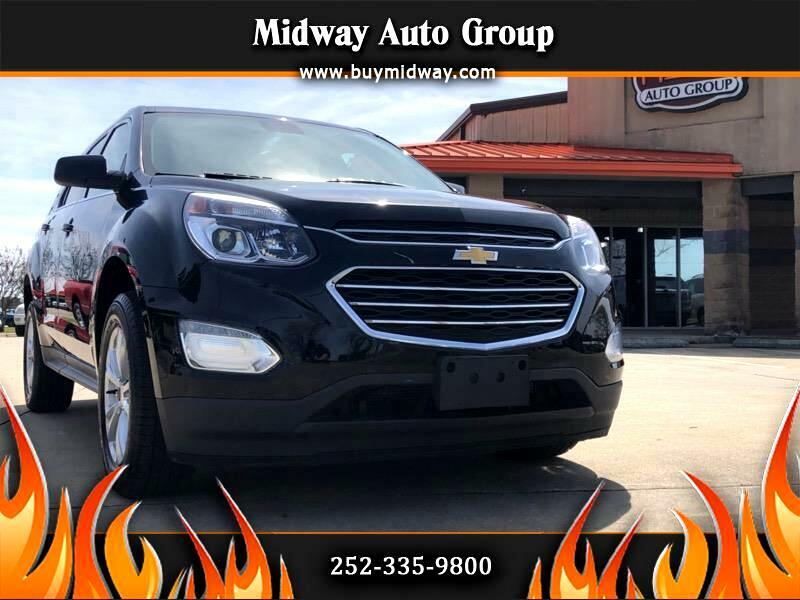 The top-of-the-line Chevrolet Equinox Premier adds leather upholstery, heated front seats, automatic climate control, and a power driver’s seat. However, it still doesn’t come with features like a navigation system or an upgraded stereo, which most rivals include as standard in the top trim level. The 2017 Chevrolet Equinox has a strong safety score for the class. It earned a Good rating (the best possible) in Insurance Institute for Highway Safety crash testing. In National Highway Traffic Safety Administration evaluations, the 2017 Equinox received four (out of five) stars for overall safety. It earned four stars in frontal and rollover crash tests, and five stars in the side crash test. A rearview camera comes standard. Available features include blind spot monitoring, rear parking sensors, rear cross traffic alert, forward collision alert, and lane departure warning. The 2017 Equinox is powered by a 182-horsepower 2.4-liter four-cylinder engine and a six-speed automatic transmission. There is sufficient power for local travel, but acceleration feels sluggish on the highway. The stronger available 301-horsepower 3.6-liter V6 engine is better-suited for highway speeds. Front-wheel drive is standard and all-wheel drive is available. The Chevy Equinox has a smooth, comfortable ride. The base Equinox gets typical EPA-estimated gas mileage for the class: 21 mpg in the city and 31 mpg on the highway. Fuel economy drops to 17/24 mpg city/highway with the available six-cylinder engine. The 2-row Chevrolet Equinox seats five on cloth upholstery. The Equinox has more interior space than many rivals, and its front seats provide all-day comfort. There’s ample legroom in the rear, and the seats slide and recline for additional comfort and flexibility. The cabin is fairly attractive and well-designed, though its materials aren’t as high-quality as rivals’. The center stack is within close reach of the driver, but its abundance of buttons results in a cluttered dashboard.